This year I collaborated with Q LTD to redesign The Kresge Foundation's website (here's the old one). We updated the information architecture and content to better reflect the foundation's priorities, while striving to improve usability, findability, credibility, and other facets of the user experience. One of my favorite parts of the process was helping the organization to engage with social media in a safe, sensible manner. We provided the education, encouragement, and design needed to get the ball rolling. Along the way, I had to answer a couple of wildly divergent questions. Ten years ago, Marcia Bates gave a talk at the University of Michigan about information seeking. Her delivery was dry and the subject quite academic. I recall plotting to escape. But once I began to understand the thrust of her argument -- that while we focus attention on design for directed search, people absorb the vast majority of knowledge (80 percent) by simply being aware in their social context and physical environment -- I was hooked. This was a provocative message to deliver in what was still largely a library school. Of course, I didn't know what to do with this knowledge. How could I design for awareness? The answer arrived years later in the forms of Twitter, Facebook, YouTube, and other social media that brought the water cooler to the Web. So, I continued, while it's comforting to believe our goals can be achieved by one or two channels, it's simply not true, which is why we must embrace a multi-channel communication strategy that accommodates the spectrum of behavior from active, directed search to passive, undirected awareness. This brings me to the second question (asked by an IT manager): since we have social media and The Web is Dead, why do we need a website? I explained that reports of the Web's death had been greatly exaggerated, and that the site remains the centerpiece of the communication strategy, providing access to the full archive, and serving as a verifiable source of authority. After all, you can't believe everything you read on the Web! 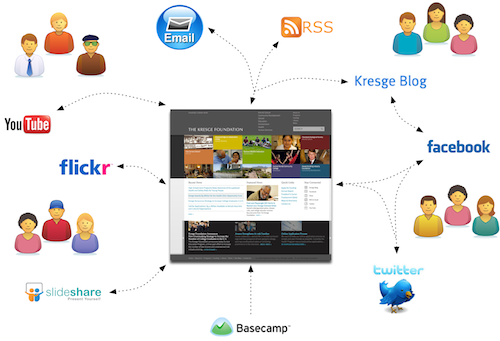 Later, I created this diagram (above) to illustrate the complex, dynamic relationships between an organization's website and its social media. As an information architect, I'm finding the diagram plus my Marcia Bates story to be helpful in explaining how and why the structural design should support multi-channel communication. It's an interesting time to be having these conversations, given the ongoing evolution of how we know what we know.